I LOVE this chili... Its hearty but not heavy! 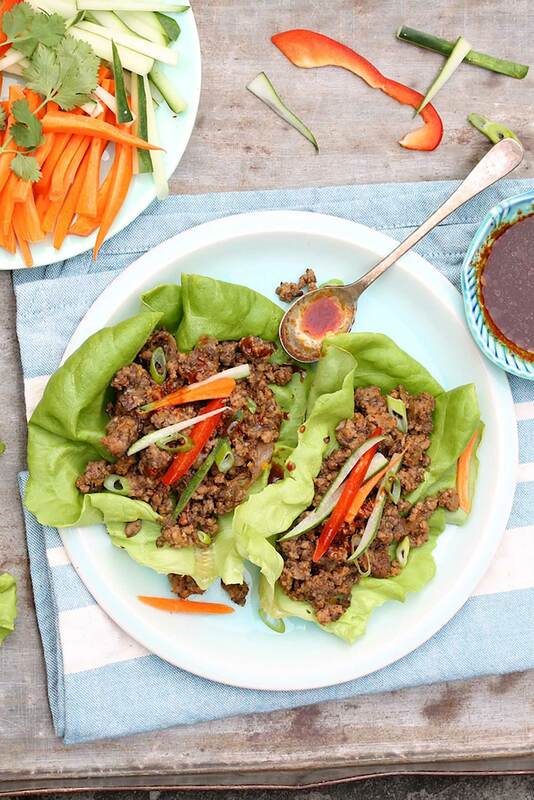 You can always add beans or use lean ground beef if you would like! Quick, healthy diner the whole family will love! This Turkey Sweet Potato Chili is so good, you might want to double the recipe!! It’s made with no beans, but you can of course add them if you wish! Add the can of Rotel tomatoes, sweet potato, tomato sauce, water, cumin, chili powder, paprika, salt and bay leaf. Cover and simmer over medium-low heat until potatoes are soft and cooked through, about 25 minutes stirring occasionally. Add 1/4 cup more water if needed. Remove bay leaf and serve. Press saute, spray the pot with oil and brown the turkey breaking it up as it cooks into smaller pieces and season with salt and cumin. When meat is browned and cooked through add onion and garlic; cook 3 minutes. Cover and cook high pressure until potatoes are soft and cooked through, about 15. Natural release. Heat oil in a large Dutch oven or heavy-bottomed pot over medium heat. When the oil is shimmering, add onions and cook until soft and translucent (about 5-7 minutes). Add squash, garlic, ginger, curry paste, and salt. Stir to combine and cook for 1 minute, until garlic is fragrant. Add broth and bring to a boil, then reduce heat and simmer until squash is completely soft, about 20-25 minutes. Blend soup well using a stick blender or, working in batches, transfer soup to a blender (do not fill blender more than halfway with hot liquid and use a kitchen towel to protect your hand from any escaping steam). Purée soup and add back to the pot. 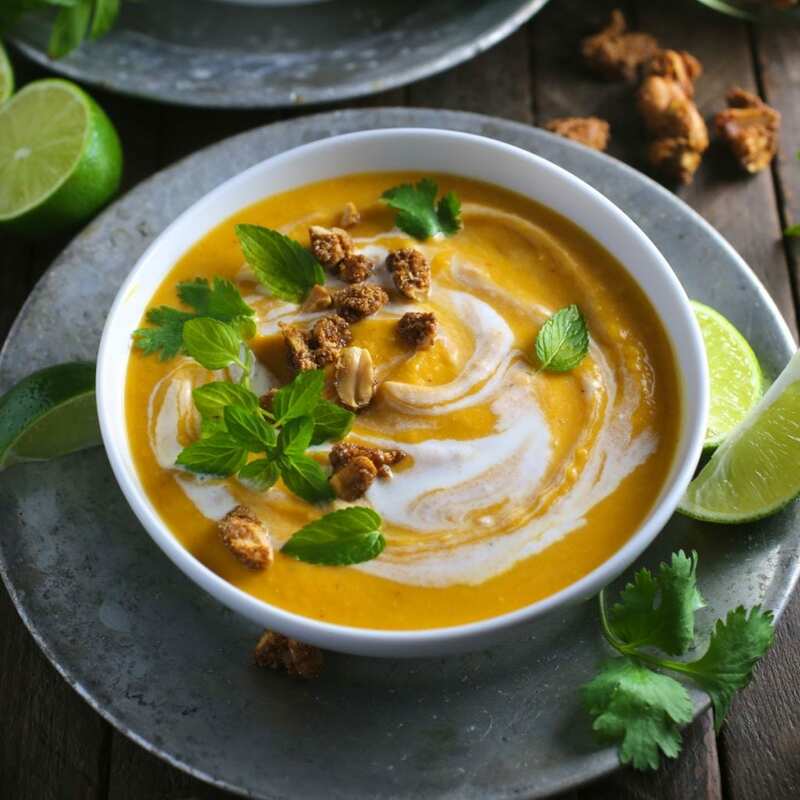 Add coconut milk and re-heat the soup until just hot, then stir in the lime juice and honey, and adjust the seasoning with salt. Ladle soup into individual bowls. Use a spoon to drizzle a bit coconut milk over each bowl. Top with Spiced Peanuts and a sprinkle of cilantro or mint. Coat all four chicken breasts with the jerk paste. Place in a large ziplock bag and place in the fridge to marinate for a minimum of 20 minutes, preferably 2 hours. When you’re ready to cook, take your chicken out of the fridge. Preheat a grill or skillet to high heat. When it’s up to temperature place the chicken on the hot grill or skillet. Cook each side for 4-5 minutes until it’s no longer pink in the middle. Remove the chicken from the heat and let it rest for 5-10 minutes before cutting in. While it’s resting you can make your mango salsa. 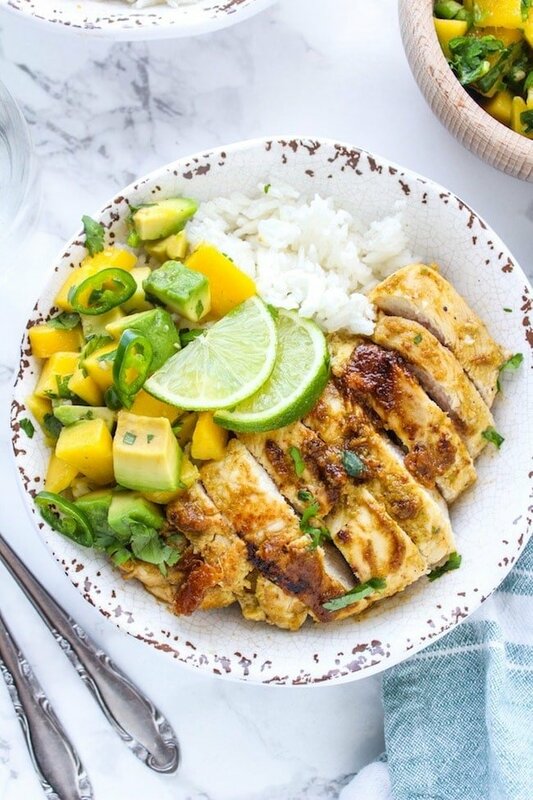 Serve the chicken with rice or cauliflower rice and top with the mango salsa and enjoy!